Ange Mitchell’s mantra is inspired by her favourite quote: “Sometimes your joy is the source of your smile, but sometimes your smile can be the source of your joy”. Applying this to life and to yoga, makes Ange’s dream simple: to help people achieve their goals with a lighthearted approach, a smile and an invitation to explore freedom. Ange’s fun-loving energy is ever-present as she creates an environment that fuses her passion for the body and love of movement with a drop of healthy competition. Ange encourages each individual to let go of thought and embrace feeling. Feel freedom in movement on the mat, and then take it out to the world. Discovering this freedom has seen Ange come out of her shell, liberating herself from the corporate life. Holding a Bachelor degree from the University of Technology Sydney and a qualified Accountant (CPA), Ange has transformed the hours behind a desk into hours of studying the powerful trio that exists within all of us: the body, mind and spirit. 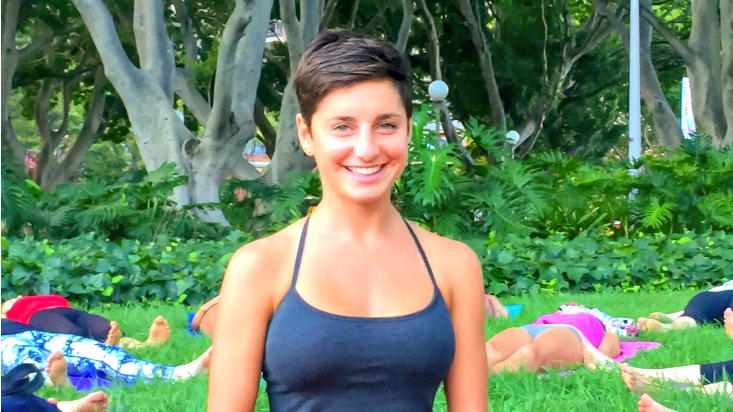 A student fresh off the block, Ange completed her 200hr Yoga Teacher Training with Nicole Walsh in 2014. She is also an AcroYoga Teacher & Personal Trainer, completing her Cert.III and Cert.IV in Fitness with recognition as the ultimate “Energizer” by the Australian Institute of Fitness. Ange truly believes that there is no end to education and is forever grateful to be blessed by the myriad of teachers and mentors that continue to support her journey. This is where she came across Power Living and the community of teachers and friends who work to constantly inspire and lift one another higher. Needless to say, Ange is excited to contribute to this family and to continue to grow as a teacher and mentor…all the while, keeping a smile on the dial. So, go on – Smile. It’s Empowering and Infectious. Feel it. Embrace it. Wheel Pose – Urdhva Dhanurasana – “Open your heart and dance to the fullest version of yourself” – I love the deep heart opening that this pose offers and the way it feels different each time I come up (or drop back) into it. Switching career paths from an Accountant to an advocate for everything health & well-being related. The lesson? Do what you love and you love what you do. The rockstars that I get to work with and learn from.